Surprises happen every week in fantasy football and taking advantage of lightly started players can win a matchup. The key is identifying trends and matchups that can lead to big points for lower tier players. The players listed below should obviously not be played over studs like Aaron Rodgers or Le'Veon Bell. These are suggestions for desperate situations where the waiver wire is being scoured for answers. Last week was Goff’s first 300+ yard passing game. In fact, it was the first time that he has thrown for more than 235 yards in a game. It will not be the last however, because he has NFL caliber weapons this year. The Rams drafted Cooper Kupp and traded for Sammy Watkins, drastically changing the landscape of the team. Goff is just starting to reap the rewards and will continue in a week 2 matchup with the Redskins. Sammy Watkins may be blanketed by Josh Norman, but that leaves Kupp to wreak havoc. Not to mention Todd Gurley, who is suddenly a factor in the passing game. Sean McVay has invigorated the Rams offense and they will have another solid game. The Bills love running the ball and they have one of the best lead backs in the game. LeSean McCoy is one of the greatest backs of this generation, but he gets dinged up. This week he has been dealing with a wrist issue and a sore groin. He is not listed on the injury report and should play well, but Tolbert is going to get carries. He has made a career out of being a goal-line vulture, but he will be more than that. In week 1 Tolbert saw 12 carries and he should see similar usage against Carolina in week 2. The yardage is a bit of a crapshoot, but he is a good bet for a score. Hurns has produced in the past and will be called upon to do so again with Allen Robinson out. The Jaguars passing game is not going to be prolific with Blake Bortles is at the helm. They have decent receivers though and that can be good enough for fantasy. The Jags would love to ground and pound, but they are going to be trailing often. Allen Hurns has had success in the NFL. 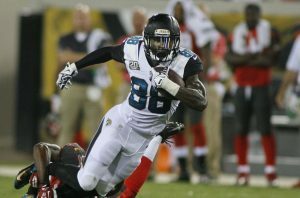 In 2015 Hurns had over 1,000 yards receiving and 10 touchdowns; he has the ability. When he sees a high volume of passes he is very capable of putting up starter worthy fantasy numbers. Week 2 brings a matchup with the Titans and the Jaguars will likely be down early. That means garbage time goodness for Jags receivers. Certain players spend their entire career as the guy that is “about to break out”. That is Jared Cook, scintillating talent that never pans out over a full season. The good news is, he is very capable of having isolated success. The other good news is that the Jets are coming to town and everyone has success against them. Just about everyone on the Raiders is a good bet to put up numbers against the Jets hapless squad. Cook appeared to be on the same page as Derek Carr in week 1 and that should continue. The Lions are not a dominant defense, but they have the ability to make plays. They picked off Carson Palmer three times and this week they face a weak Giants offense. Even if Odell Beckham Jr. plays, he is obviously not healthy. The Giants have zero run game and Eli Manning is in the twilight of his career. The Lions revitalized offense will keep the defense off the field and rested. This could be a sneaky streaming pick for week 2. If it comes down to playing a desperation starter, these guys are worth a shot. To make sure that you don't have to rely on them more than once make sure to check out our waiver wire picks weekly. As always, follow us on Twitter for more insight and analysis: @_knuckleheads and @brendancole16.